Bangkok is home to more than nine million people. Many people fly to Bangkok and spend a few days there for travelling on to coastal resorts or other tourist destinations in Southeast Asia. There is so much to see and do that it would be a shame not to stop, but getting around this sprawling city can be difficult at times. 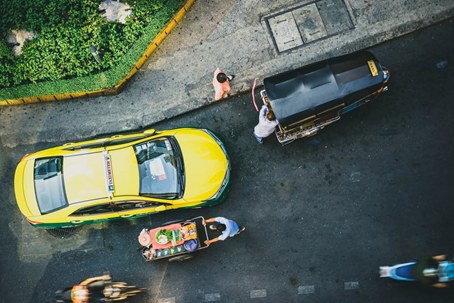 In this article, we are going to offer some tips to help you navigate Bangkok by car, motorbike, taxi, or on foot. Maps or map apps are a handy way to see where the main attractions are and how far they are in relation to your current location. Old-fashioned maps are best if you don’t want to run up a huge data bill by navigating with Google Maps. You can pick up a map from your hotel or hostel or buy a guidebook with a fold-out map included. There are various transport options available in Bangkok. The right one will depend on where you are going, what time of the day it is, and how much money you have. Use the Skytrain to navigate around the inner city in Bangkok. Whether you are travelling between business meetings or looking for a restaurant, the Skytrain (BTS) will take you around the main business district in relative comfort. Be aware that the service ends at midnight, so carry some cash for a taxi or tuk-tuk. Jump on the MRT subway train if you need to travel to a location where the BTS doesn’t go. Some stations act as intersections for both the Skytrain and the MRT, so you can switch between them. Taxis are the most convenient option at night and most people use them. Taxis will take you places the BTS doesn’t reach, as well as the main tourist attractions and your hotel or hostel if you are lost. Watch out for taxis that try and charge you a fixed rate. All fares are metered, so look for another taxi if you think the driver is trying to scam you. Motorcycle taxis are great for short distances, but expect to be overcharged. If you do take a motorcycle taxi, always wear a helmet or it could be the last journey you ever make. Tuk-tuks are an iconic sight in Bangkok. They are the cheapest way of getting around, but tourists are often ripped off. If you use a tuk-tuk in the main tourist areas, expect to be scammed unless you look like a local and speak the language. If you are staying in Bangkok for a while, it might be cost-effective to hire a car or motorcycle. Check out a local car rental company or look for a rent a motorbike Bangkok outlet. Motorbikes are better in heavy traffic than a car, as they can weave in and out of stationary traffic. Choose from a Vespa-style Honda Scoopy or a more robust BMW F800GS. Have fun in Bangkok and stay safe when you catch a ride late at night! What are the key benefits of buying MAZDA in Malaysia?